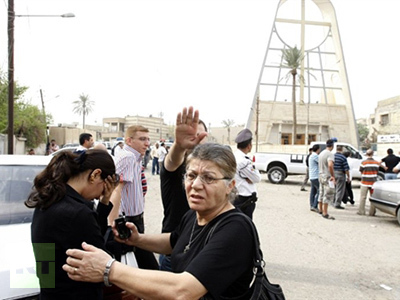 Iraqi and US security forces stormed a Catholic church in Baghdad, near the heavily fortified Green Zone on Sunday evening to free about 120 hostages. ­What began as a regular weekend Mass at Our Lady of Deliverance in the center of Baghdad, has ended in a nightmare for the congregation, and yet another painful reminder for the Iraqi people that a return to normality for their war-weary nation may be a long way off. Iraqi and US security forces stormed the church in the heart of the Iraqi capital, bringing to an end a harrowing four-hour hostage drama that has left 52 people dead, including two priests. Maj. Gen. Hussein Ali Kamal, the deputy interior minister, said Monday that 52 people were killed and 67 wounded, in the attack. Officials said at least two priests and ten policemen were among the dead, while investigators are still trying to determine the identities of the deceased. Benedict then called for new international and national efforts to end the violence that has become a daily part of Iraqi life since US forces began military operations on March 20, 2003. Officials said the militants first attacked Iraq’s stock exchange building, and then took over the Catholic church across the road, clashing with guards and killing several of them. The hostages were caught in the crossfire between Iraqi and US security forces and the hostage takers. Residents of Baghdad’s affluent Karada district, which is in close proximity to the US Green Zone, told reporters that at about 5pm they heard several loud explosions, followed by gunfire. One freed hostage gave the following account of events to local media. said a young male parishioner who asked not to be named. Another woman, accompanied by a young girl, recounted how the gunmen freed some of the parishioners, and killed others in cold blood. 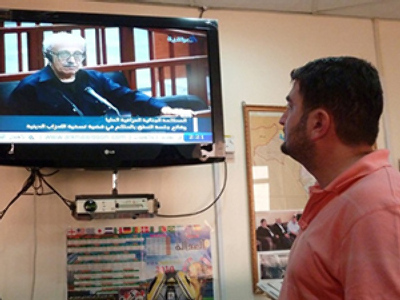 The local television station, al-Baghdadiya, said it had received a phone call from an individual claiming to be one of the attackers, who said they belonged to the Islamic State of Iraq, a Sunni umbrella organization to which al-Qaeda in Iraq belongs. According to officials who have examined transcriptions of the mobile phone calls, the attackers were not Iraqis, but foreign Arabs. Abdul Qader Al-Obeidi, Iraq Minister of Defense, told local media. The defense minister added that the attack carried all the classic hallmarks of Al-Qaeda. The gunmen had reportedly demanded the release of jailed al-Qaeda militants as well as a number of Muslim women they said were being held prisoner by the Coptic Church in Egypt. Al-Obeidi said security forces took the decision to attack the hostage takers because they believed they [the attackers] were getting prepared to kill all the Christians in the building. “The terrorists were planning to kill a large number of our brothers, the Christians who were at Mass "So the operation was successfully done. All terrorists were killed. And we now have other suspects in detention." Witnesses told media that they saw US troops on the ground and US military helicopters hovering above the scene. The full extent of their participation in the siege is now being determined. There are about half a million Christians in Iraq, although their numbers have dramatically fallen since the start of the Iraqi invasion. The latest violence in Iraq, which happened in close proximity to the American Green Zone, comes at a sensitive time as US forces are in the process of handing over security duties to the Iraqis. "Tonight, I am announcing that the American combat mission in Iraq has ended. Operation Iraqi Freedom is over, and the Iraqi people now have lead responsibility for the security of their country,"
"As our military draws down, our dedicated civilians – diplomats, aid workers, and advisers – are moving into the lead to support Iraq as it strengthens its government, resolves political disputes, resettles those displaced by war, and builds ties with the region and the world." Jim Brann, member of the anti-war group, "Stop the War Coalition", believes it was necessary for the US to withdraw, to allow Iraq to start rebuilding itself. "United states forces are a powerful factor in Iraqi politics. They are a kind of central determining factor. And since Iraqis overwhelmingly believe that the US invaded Iraq for its own interests, that is how US forces must be seen by Iraqis – as a force with its own interest etc. The principle of the United States forces leaving seems to me absolutely correct." But as the latest attack in Iraq shows, Baghdad will require crutches for a long time before it can walk again on its own. Indeed, some say that the pullout of US troops, while certainly a much-desired event for the local population, was a bit premature in light of the threats. Although it is now known that Iraq presented little threat to the western world before the United States and its reluctant allies opened their attack in 2003, the military operations, which removed the stabilizing force of Saddam Hussein’s Ba-athist Party, have seriously altered the political calculus in the war-torn country. Iraq is now awash in religious [i.e. Sunni Muslim] fervor, much of which is being directed against the new government, and, as the recent attacks show, people of different faiths. Whether or not Iraq will be able to continue weathering such storms in the future without heavy US assistance remains to be seen. But with America’s hands tied in Afghanistan, it also remains to be seen to what degree the United States military will be able to lend its assistance if needed on a wide scale. Thus further evidence that the United States should never have gotten itself involved in Iraq to begin with.